High-density polyethylene (HDPE) is the type of polyethylene offering the highest rigidity and least flexibility. The rigid and slightly hard plastic is highly suitable for a broad range of applications such as rigid containers and tubes as well as a variety of everyday household goods such as flasks, clothes pins, or handles of dishwashing brushes. Further, HDPE is processed into films. Ceresana already publishes the fourth study on the world market for HDPE. The current study expects a growth of the HDPE demand of, on average, 2.7% p.a. until 2024. The Asia-Pacific region is by far the largest consumer of HDPE with a global market share of about 45%. This region will experience the most dynamic growth in the upcoming eight years, however, not in the same extent as in the past. The development in Western Europe is reverse: While the HDPE market only registered marginal growth in the past, it will presumably increase at higher rates. The most important HDPE methods of processing are extrusion, blow molding procedures, and injection molding. The extrusion of films plays the most important role: Almost 11 million tonnes were processed in 2016. Ceresana forecasts growth rates of 3.3% per year in the upcoming eight years for the processing of pipes and profiles by extrusion. Milk bottles, water pipes or fireworks: HDPE is used for a wide range of products. In 2016, this plastic was mostly used in the production of rigid packaging. Almost 28% of global HDPE were processed into butter dishes, yogurt cups, trays, bottles, boxes as well as caps. Another significant application area are products for the construction industry, such as tubes and cables. The demand for HDPE in the construction industry will presumably develop especially dynamic. Chapter 1 provides a presentation and analysis of the global market for high-density polyethylene (HDPE), including forecasts up to 2024: The development of demand (tonnes), revenues (dollar and euro), as well as production (tonnes) is depicted for each region. 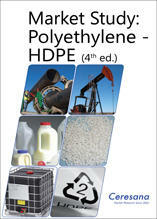 Chapter 3 offers a detailed analysis of applications for HDPE. Data on demand development in individual applications are given for the world as a whole and split by the regions Western Europe, Eastern Europe, North America, South America, Asia-Pacific, the Middle East, and Africa. Information is given for the segments flexible packaging, rigid packaging, construction, transportation, industry and E&E, and other applications. Chapter 4 provides useful company profiles of the largest producers of HDPE – clearly arranged according to contact details, turnover, profit, product range, production sites, capacities, and profile summary. In-depth profiles of 79 producers are given, including Braskem S.A., Chevron Phillips Chemical Co. LLC, China National Petroleum Corporation (CNPC), China Petroleum & Chemical Corp. (Sinopec Corp.), ExxonMobil Corporation, INEOS Group Ltd., LyondellBasell Industries N.V., Saudi Basic Industries Corp. (SABIC), The Dow Chemical Company, and Total S.A.